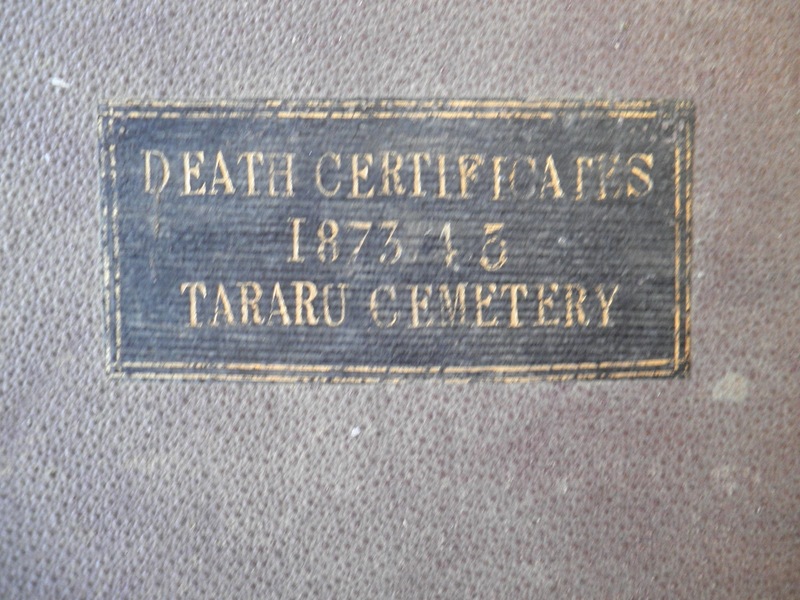 The Death certificates for TARARU CEMETERY 1873-4-5 are available at Auckland Archives (ABWN 8102 W5279 184 / AUC 842). With special thanks to 'my archives helper', a copy of these is now available view at The Treasury, Thames. 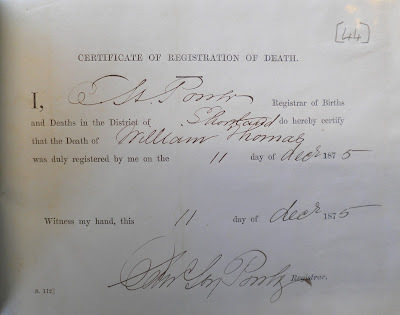 The Death certificate varies from what we would expect today. 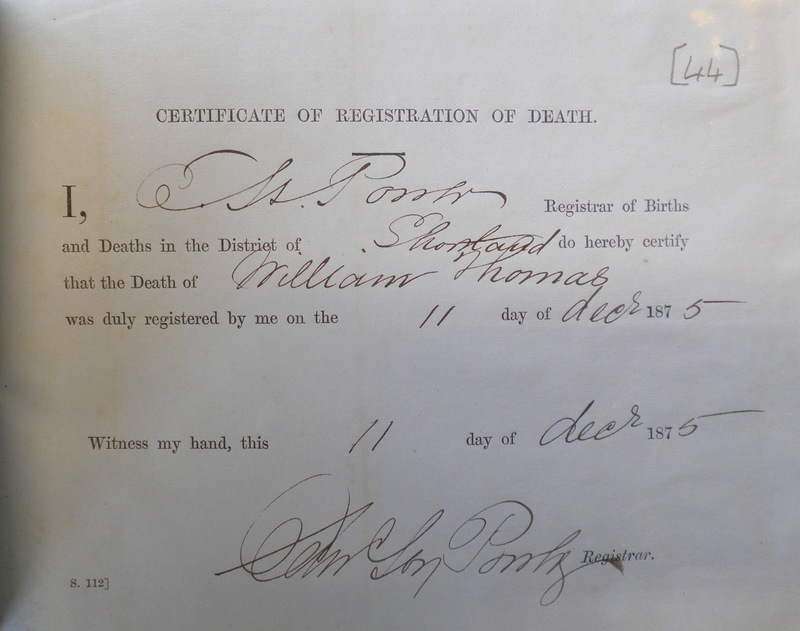 It has the name of the deceased and the date of registration with the Registrar. This was necessary in order for the burial to take place. 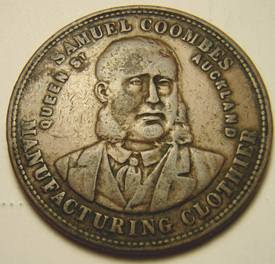 An interesting item online today, a coin produced by Samuel COOMBES, shopkeeper of Grahamstown. Many businesses in Shortland and Grahamstown produced similar coinage in the early years of the goldfield. 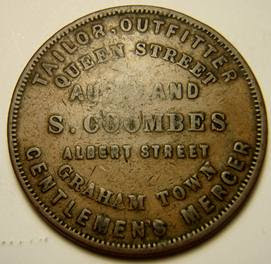 In August 1874 Samuel COOMBES sold his clothing business, Albert street Grahamstown to T BRIDGER. In recent weeks I have heard from several people asking about Tararu cemetery, so thanks to Dave for climbing the hill and getting these great photos. 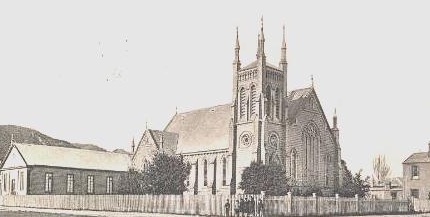 To date it is unclear when the first burials took place, but it was pre July 1873. In the Daily southern Cross 30/7/1873, there is concern expressed for the need for a bridge over the Tararu Creek and the need to sort out the native land title, so that the cemetery could be used again. 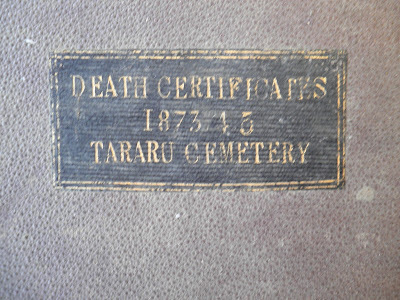 Interesting to note that in 1874, it was noted that very few burials were taking place at Tararu. Given that the majority of the population were some distance away, this is not surprising. Remembering the logistics of getting to Tararu from Shortland or Grahamstown would have been daunting for even the fittest of funeral processions. Visit the site to find see more names. A CD is available from Colonial Books, "NEW ZEALAND TEACHERS EXAMINATION 1880 - 1920"
Special thanks to the researcher who sent in a copy of this business..not previously listed in my database. In the Directories there are listings for a shop called 'Thames Fisheries' from 1922, continuing into the 1940s. (at Least!) There are reports in the Thames Star for the "Thames Fisheries Ltd' and in 1920 they report that they have just purchased the freehold to one of their shops. Directory listings sadly do not give a location of the shop. It was typical for Thames-ites to stand outside their shop while a photo was being taken, it is therefore assumed that Miss Amelia Beatrice (Beattie) James is the owner or in charge of the Thames Fisheries Shop. Many questions remain..that's the fun side of genealogy to hunt for answers. The Fretwork on the verandah poles is of interest to me to try and locate the situation of the shop. Shops at the Grahamstown end of Pollen Street, and in the area opposite Walter street all seem to have this style of pole. The tiling is unique and not dissimilar style to that of the famous Charles Palmer Sweet Shop (but without the mirrors).﻿ It reminds of the shops in the Mary to Pahau street block of Pollen Street, but the lack of a second storey or fancy top facade is confusing. If you have any ideas on location, please email me :) along with any business photos that you may have.